This mornings breakfast was grits, bacon, toast and coffee. On my kitchen table is a mixed bouquet of flowers bought at the store with the big W on it. I rarely bought flowers, when I lived in the country. I grew my own. Giant sunflowers, zinnias, coreopsis, day lilys, and of course, roses. Forth of July roses, red with white stripes, smelling like cinnamon apples, grew to cover the front of the hen house. A row of yellow SUNSPRITE Roses flanked the fence, at a safe distance from the bull pen and the long, hungry tongues of the bovine. On a recent trip to Washington D. C., I was pleased to see that the Smithsonian grew these in their rose garden. Another favorite rose was a selection called Easy Does It: Medium sized, coral blooms that open up and turn pink. All of these were easy to care for and prolific bloomers up to the first frost. My roses are now in the care of another. I hope they appreciate them. The other week I ran to the local grocery store for a few things. On display at the front of the store were pots of miniature roses. They were nearly dead and marked down to just pennies. I bought four of them. On the patio, I repotted them, cut off the dead stems and fertilized them. I was not real hopeful that they would survive our sweltering summer, but wonder of wonders, two of the four have made it! One, after pruning the dead away, is only about four inches tall. Yet, it is as green as can be and makes me smile, when I look at it. 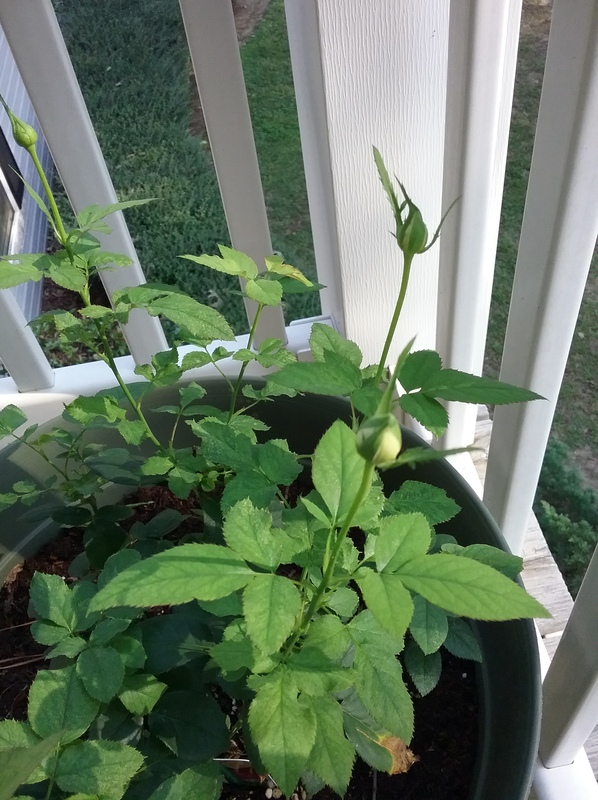 I believe it will have tiny red buds when it blooms. The other rose that survived is doing more than that; it is thriving. The little bedraggled plant has doubled in size and has put on four buds. The buds are on solitary stems, miniature yellow tea roses. Yellow roses are my favorite, partly because one of my dear aunts loved them. Different colors mean different things. Yellow means friendship, joy. Red, of course, is for romance. Pink symbolizes love and appreciation. 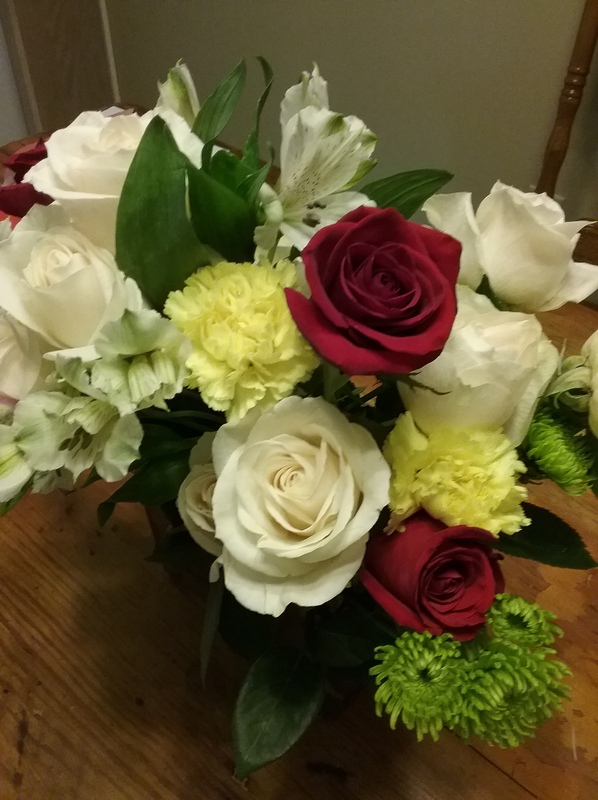 White roses impart purity (think wedding bouquet) spirituality, sympathy. Orange roses evoke passion and desire. We never know what may be around that blind corner. Life is short. Life is tough. Whether a bouquet from the big chain store or worn out pots from the local grocery, buy the roses. This Saturday morning I awoke early. 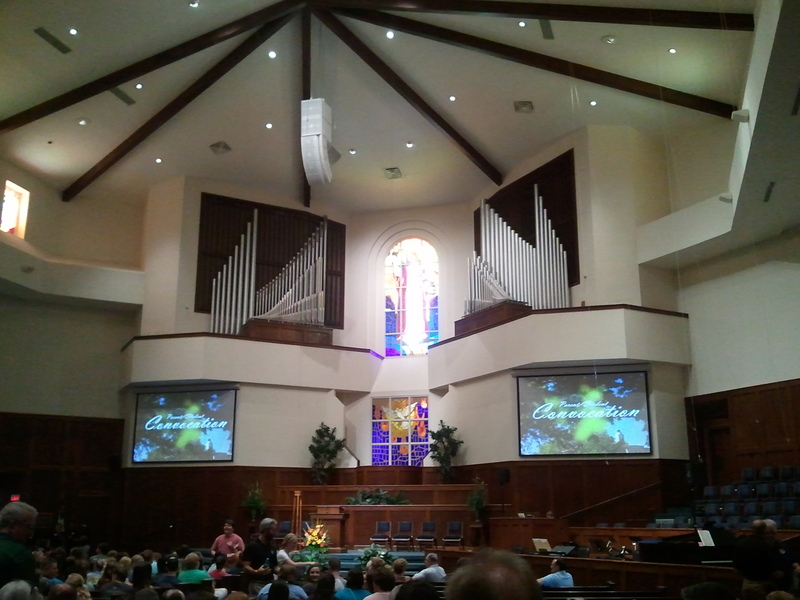 The day that I had thought about for 18 years had come: My youngest son went off to college. Not by himself, I followed him up to the school he will be attending. His father also went. This day was not as I had imagined all those years ago. To say it was bitter-sweet is trite. As a family we did everything that we were suppose to do: Checked in, arranged my son’s dorm room, got his student ID, and parking decal. But there was a huge, wheezing pacaderm in the room with us and it followed us around campus. As I’ve mentioned in an earlier writing, I am going through a divorce. The tone of the whole day was shadowed by my marriages demise, even though it was a sunny, late summer day. When we took our older two sons to college, those days were much more like celebrations. Sad yes, a little- okay, a lot with the second one. The oldest son had such bright hopes and an attitude to match. We knew he would do great things and when he made the dean’s list the first year, we were confident he would finish well. I’ll just say that he did finish. Junior year of college was a challenge for us all, to say the least. Sending our second son off to college was harder. We knew what expect. We were broken in. He was a prepared, confident, bright young man who knew what he wanted to do. I remember hugging him good-bye and hearing a heart-wrenching intake of breath. He was crying. I started to cry and did so all the way back home; it was a four hour trip. Today was just odd, different, though I tried and his father tried to behave as normally as possible for the sake of our son. The initial tension between my soon-to-be ex and I relaxed after the first tasks were completed. Conversation became easier. I found myself making jokes. My son and his father laughed. On the ride back home, a thought struck me. For the better part of our 29 year marriage, my biggest goal, desire had always been to make my husband laugh. The first night that I met him I wanted to feed him (he’s 6′ 1″ and at the time only 165 pounds), iron his shirts, and make him laugh. For the first 28 years, I seemed to do a really good job of all three. The 29th year, yeesh! So, today, when I’d say something and he would laugh there was no payoff for me. My goal wasn’t to make him smile or chuckle. It was unconscious to say something funny, just part of who I am. Why he laughed, who knows? Habit? Trying to be pleasant? I guess what I’m saying is that over the course of a years seperation, I’ve learned that my self-worth is not and should not be found in making someone else happy. Not solely. Yes, supply a happy homelife, possess a pleasant demeanor, but don’t wrap yourself up in the payoff that one day might not be there. Here’s where I have my self-worth; I am closer to God now than I have ever been in my whole life. He is the only one I try to please. People are fickle, contrary. God alone is constant. He is the same yesterday, today, and tomorrow. Pleasing Him is my goal. I have a feeling that He laughs at me quite a bit and there’s a payoff worth striving for. It’s A Pecan, Not A PeeCan. It’s a little cooler this week. The temps are only suppose to be in the high 80’s to low 90’s, instead of triple digits. Even though it’s still August, here in our part of the world, school has started. There was a big jamboree at my kids’ old high school yesterday. Proud to announce that their Alma mater pulled out the win over a school in the area that they’ve never played before. This other school is a big public school and the one that my boys attended is a small independent school. There has been a lot of boasting over the years from both schools; both believing that they could beat the other. Well… that was settled last night. Good sportsmanship prevailed on both sides. Each school did the county proud. I mentioned all of that to bring up autumn. The start of school always ushers in cooler temperatures with skies clear and high. Next month is my favorite month. Ah, Septrmber. The air is less humid, the leaves start to fall ( mainly because we don’t get much rain this time of year). Mums on the porch. Potted pansies. Stacked pumpkins in an old rusty wheel barrow. 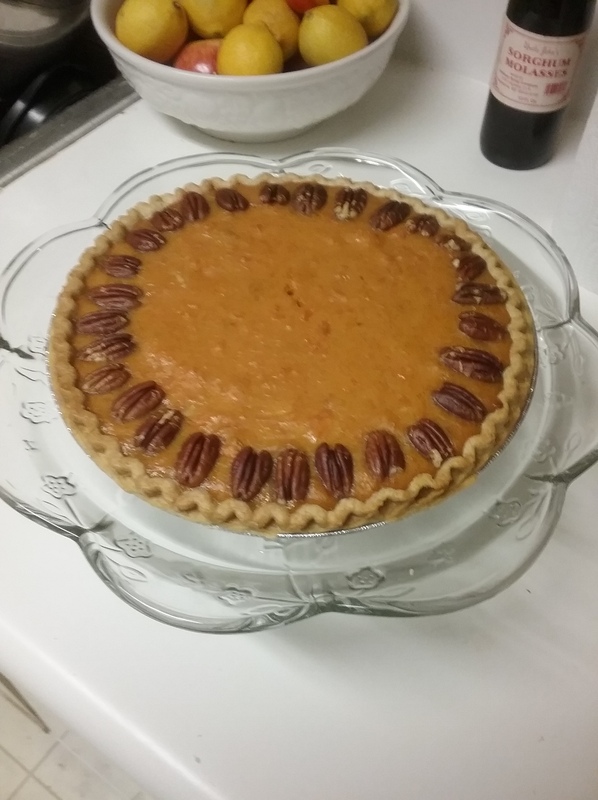 Two favorite staples in this Southern Exile’s kitchen are sweet potatoes and pecans. Please, people, it is pronounced peh-cons. I don’t eat, cook or bake with anything called a peecan! A peecan is what an environmentalist takes with him to the woods. Now, what do you want to eat: pecans or peecans? Ain’t no amount of sugar or butter gonna make the latter taste good. Peh-cons. Pecans. Say it. Dig down deep and say it right. Drain and mash sweet potatoes, along with the butter. Pour in the entire can of sweetened condensed milk and pumpkin pie spice. Mix together. In a small bowl, whisk egg, adding a little bit of sweet potato mixture to it. This is tempering the egg; adding the egg straight to the warm sweet potato would cook the egg. Not good. Not what you want. Add in your tempered egg and mix it in thoroughly to your sweet potato. Pour into your partially baked pie shell. Around the edge of the pie, place a ring of pecan halves perpendicular to the crust ( and you thought you’d never use geometry). 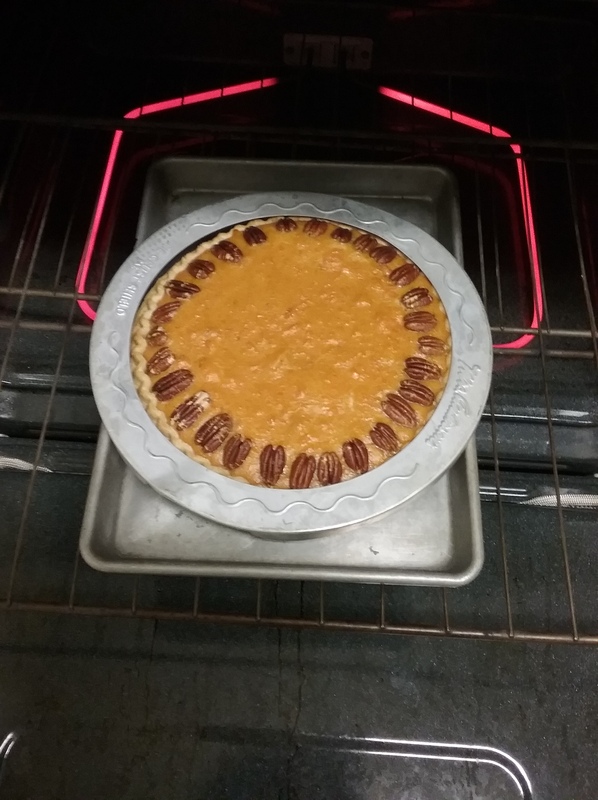 Place the pie on a sturdy cookie sheet, and bake in the oven at 350° for 35 to 40 minutes or until a knife inserted in the middle comes out clean. Tip: Check the pie crust half way through baking, to make sure it isn’t getting too brown. A pie guard is a great tool in the kitchen. If you don’t have one, cut out the bottom of an aluminum pie plate and it will do the trick. Covering the edges with loose tinfoil will work, but the pie is hot by this point, etc. A Panini Maker? I Don’t Need No Stinking Panini Maker! A Panini Maker? 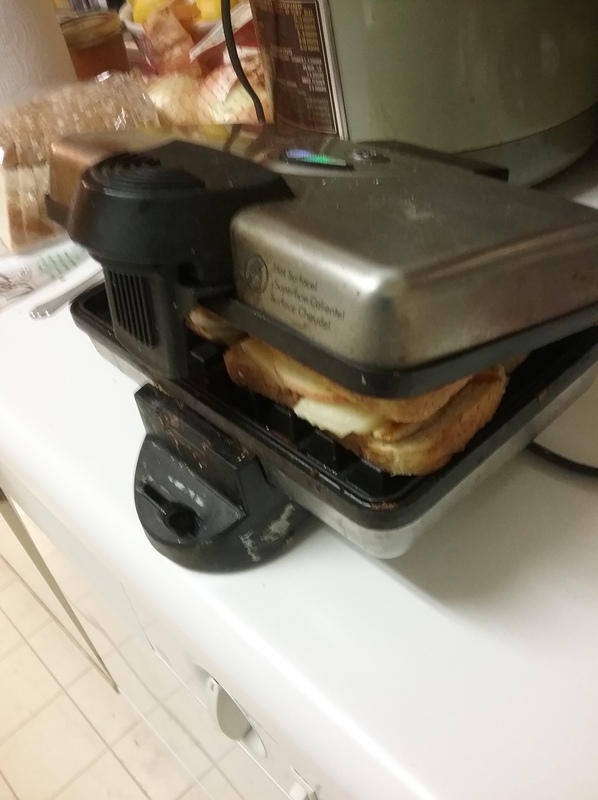 I Don’t Need No Stinking Panini Maker!. The Exile’s Kitchen has no panini maker. I have been in exile for 10 months. The kitchen is tiny. There is no room for basic kitchen wares, much less specialty small appliances like a panini maker. Earlier in the year, I saw a recipe for an apple, cheddar, and ham panini. Looking for something new to try, I thought I’d go home and give the recipe a chance. One problem; No panini maker. But wait! I did have a waffle iron. It’s a little messy, a little small, but gets the job done. When there’s no room to do, you learn to make do. This type of sandwich has become one of my youngest son’s favorite quick suppers. Build your sandwich on an open and hot waffle iron that’s been coated with vegetable spray. Be careful. It’s hot. Don’t be an idiot. I do bread, cheese, chicken, apple, bacon, cheese, and another slice of bread. Carefully close the waffle iron and press down on the handle till you see the cheese starting to melt. Be careful. Flip the sandwich, at this point. I used a pair of long handled tongs to do this step. When everything is squished together and a melted conglomeration of flavors, remove to a plate and make another. I made three last night. I ate one and my son ate the other two. Don’t need a panini maker. An old George Forman griil would work, too. 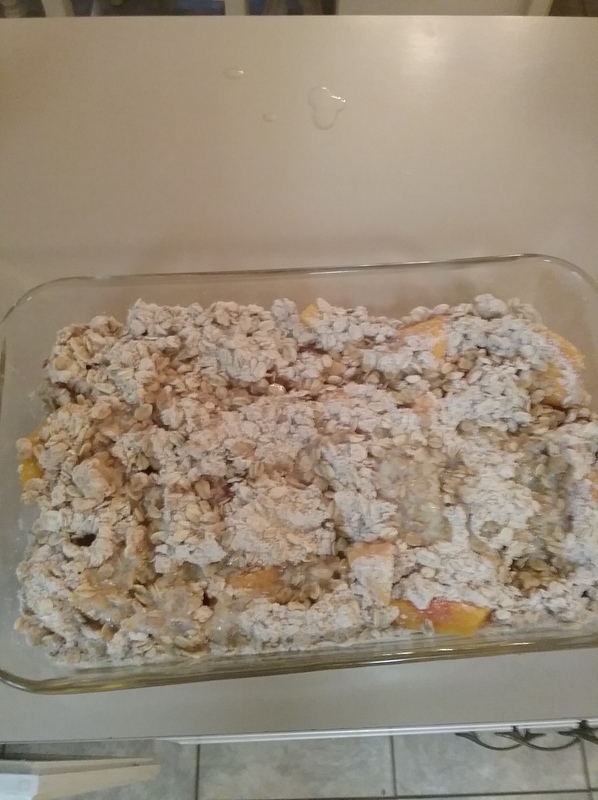 Farmers’ Market, 100° Temps And Peach Crisp. 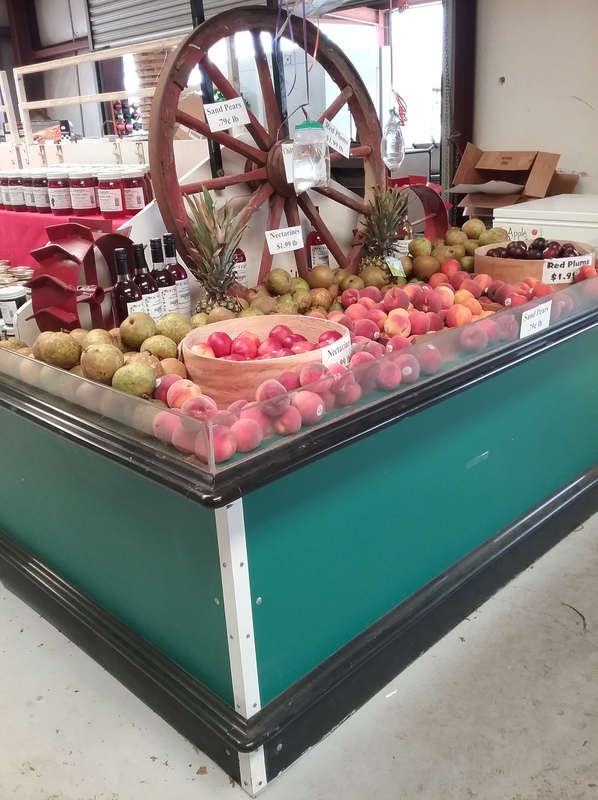 Saturday mornings excursion was a hot trip to a farmers’ market in Lincoln County. 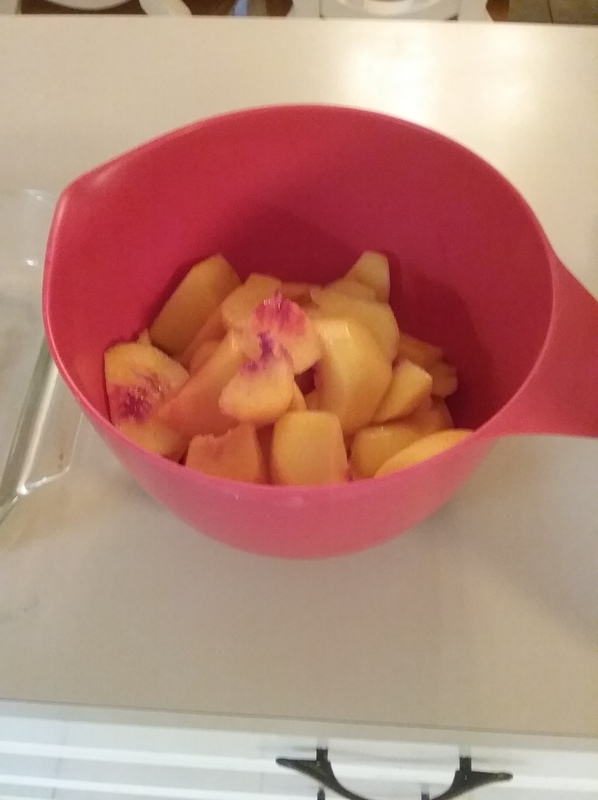 It’s peach season in our part of the world, so a bag of the fuzzy fruit made it into my buggy ( that’s a shopping cart for those of you living above the Mason Dixon Line and west of Texas). 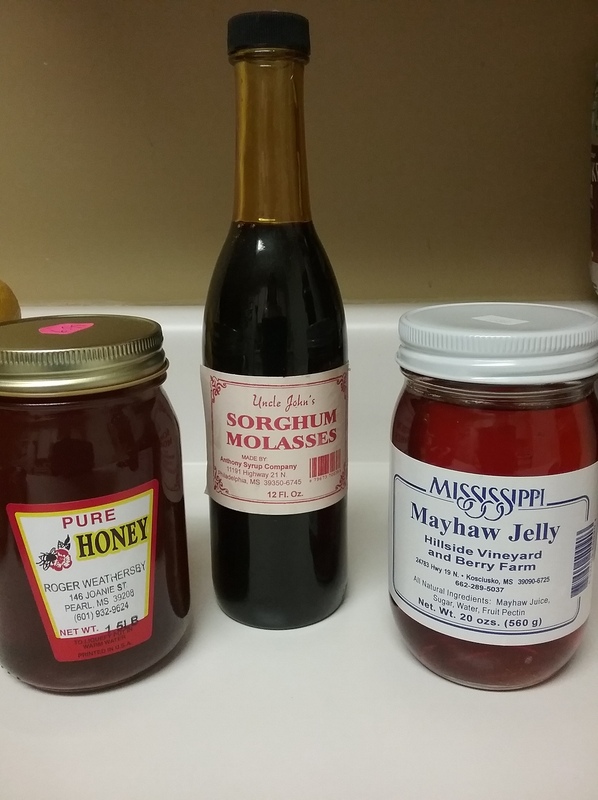 Local honey, sorghum syrup, and may haw jelly joined the peaches. A head of lettuce and red, ripe tomatoes would become lunch in a traditional BLT. Fresh pink eye, purple hull peas and big eggplant were bought for supper sides this week. 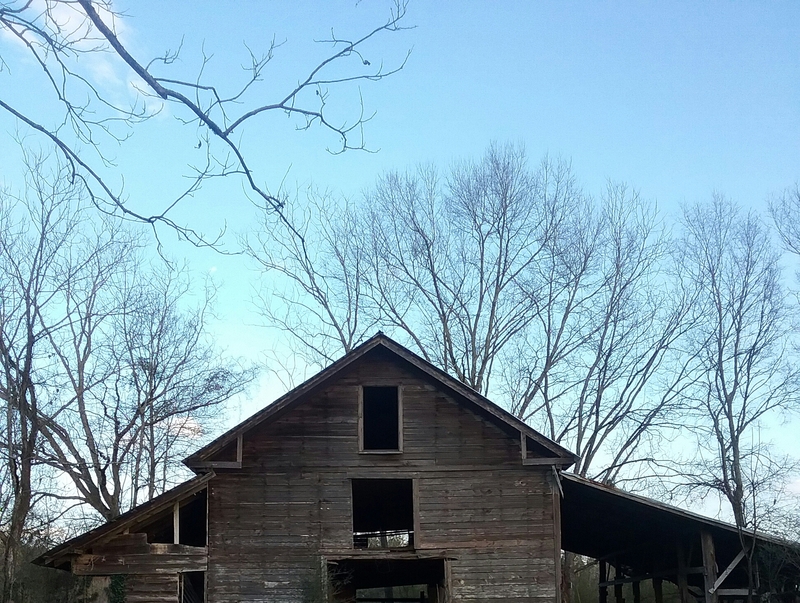 The temperatures in Mississippi have reach the century mark in recent weeks. Can you say oppressive? On the drive home, the car started running hot! Windows down, booked it back home. 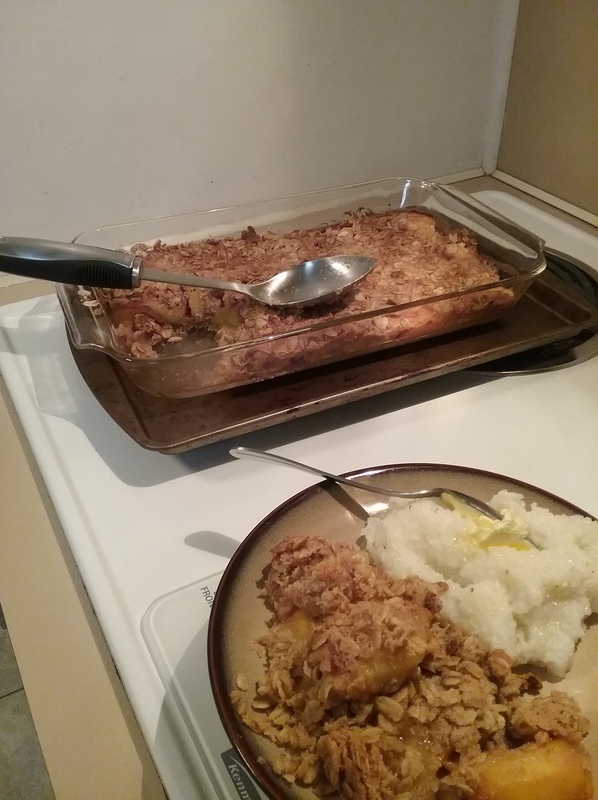 Sunday’s breakfast was Peach Crisp and Jim Dandy grits. Peel and cut up 8 ripe peaches. Evenly spread them out in a baking dish. Sprinkle with a tablespoon of sugar. Mix together 1 cup of Bisquick baking mix, 1 cup of old fashioned oats, 1/2 cup sugar, 1 teaspoon cinnamon, 1/2 stick melted butter. Sprinkle over the sweetened peaches. Drizzle another melted stick of butter over the oatmeal mixture. Place in a 375° preheated oven and bake for 30 minutes.